In a sign that ties between Iran and India are warming, India’s Petroleum Minister Dharmendra Pradhan said that India is prepared to invest $20 billion in the creation of Iran’s Chabahar port and has requested it to allocate sufficient land in the Chabahar Special Economic Zone (SEZ), state-run Oil and Natural Gas Corp (ONGC) said in a statement here on Sunday. Petroleum Minister Dharmendra Pradhan at a meeting with his Iranian counterpart Bijan Zangeneh made India’s intention in Tehran on Saturday. “In this respect, he requested Iran to allocate appropriate and adequate land in the SEZ. He also expressed India’s interest in setting up an LNG plant as well as a gas cracker in the Chabahar port,” it said. “He also requested the Iranian side for favourable treatment in the pricing of petrol for India and additionally supply of rich gas at competitive price and on long-term basis for the life span of the joint venture projects that Indian companies have an interest in setting up,” it included. In May 2014, Iran and India signed an MoU to jointly develop the port once the global sanctions against Iran were lifted. Chabahar is situated in the Gulf of Oman to the border with Pakistan, and Iran plans to turn it into a transit hub for immediate access to marketplaces in the northern area of the Indian Ocean and Central Asia. 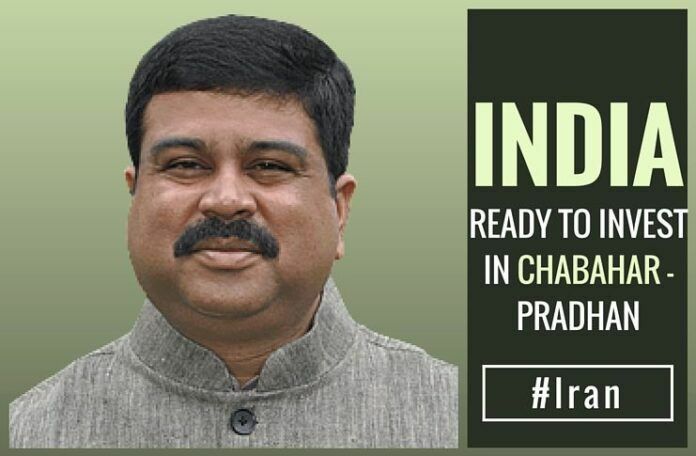 The statement said Pradhan also expressed India’s interest in importing LPG from Iran and said that companies from both sides could, if needed, discuss setting up an extraction plant in Chabahar. On the final day of his two-day visit to Iran on Sunday, the first by an Indian minister to the state since sanctions against it were lifted earlier this year, Pradhan and his delegation visited the Chabahar free trade zone and port and discussed the facilities and incentives which could be offered to Indian companies, it added.